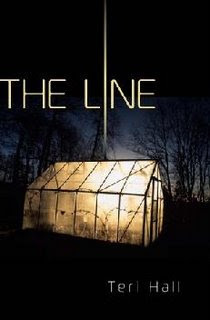 It's (finally) the release day for The Line by Teri Hall, a book that I simply adore! I hope you all enjoy it as well! Far away from the overcrowded cities where the oppressive government tyrannizes its people and the only thing that ensures a decent life is money, Rachel and her mother live and work quietly on The Property, owned by the distant and aloof Ms. Moore. Bordering the Property is the Line, the most notorious section of the invisible boundary that borders the country. No one is allowed in or out. No one knows what is beyond the Line…until Rachel receives a mysterious recording, begging for help. Now everyone on the Property will have to decide to do what is right, or what is safe. Teri Hall's debut novel is absolutely captivating; her smooth storytelling and completely convincing and authentic voice bring the story to life and make it all the more chilling and believable. Hall presents the history of the country in a detailed (but certainly not boring) manner that highlights political struggles, a domineering government, and the horrors and terrors that are bred with war, relating them to a society that is not unlike our own and subtly warns against the use of nuclear weapons. Those messages aside, the novel is full of strong female characters as well; resourceful Vivian who had to raise Rachel on her own, the secretive Ms. Moore, who knows more about the Line than anyone would ever suspect, and Rachel, who is torn between standing up for what is right and following in her mother's footsteps of playing it safe and becoming invisible. The Line is a complicated knot of twists and secrets, surprises and revelations that only becomes more and more complex as you delve deeper into the story. And once you believe you've untangled it all, it is then that the biggest mysteries of all are revealed. Hall's debut novel is stunning, and it will leave you hanging in anticipation of a sequel and pondering the outcomes for many hours after the final page is turned. Cover Comments: This cover is unbelievably amazing--I love how creepy it feels! The greenhouse is perfect, as it is relevant to the story, and I just love the colors used. The font is very modern, which fits as the book is a futuristic read. This is one of the best, most outstanding covers I've seen in a long time! All hail to strong female characters! Great review! Do you think boys would like it? Sounds really good! Reminds me a bit of EMBER, which I loved. I am really interested in reading this one! Great review! That sounds really interesting. Thanks for reviewing it! Agreed! It's what appealed to me the most! Funny story--I was flipping through the Penguin catalog, which is where I first saw THE LINE, and it spoke to me so much, I leaned over and said to the woman who was on the subway next to me, "Isn't that an AWESOME and creepy cover?" The cool thing is that she agreed with me! How cool! I just emailed Teri to ask her to do a Cover Story. Hope she wants to! I hope so too! I LOVE reading Cover Stories! I just put this on my TBR list yesterday. It looks good, and I'm glad you liked Hex Hall; I was with you on the magical boarding school overuse and wasn't going to read it. Aww i wanna read this book so badly but sadly i dont have the chance to buy it.. cos i live in south america and this books i think will come like.. next year... i hate to wait a full year.. buu!! can any one tell me if it founds some place to download it for free? Thanks!!! Just a reminder to everyone: posting books online is illegal, and reading them is WRONG. When you do that, the author nor the publisher receive any financial benefits, which means they don't have the means to produce more of those books you love. Try an international book swap program like bookmooch.com, or bookdepository.com (they have discounted books and ship to anywhere in the world for FREE) if you really want to read a book not available in your area, but do NOT violate copyrights!